The HRV is simply the time difference between each successive heartbeat, otherwise known as the R–R interval or the inter-beat interval. How is HRV used to determine recovery status? 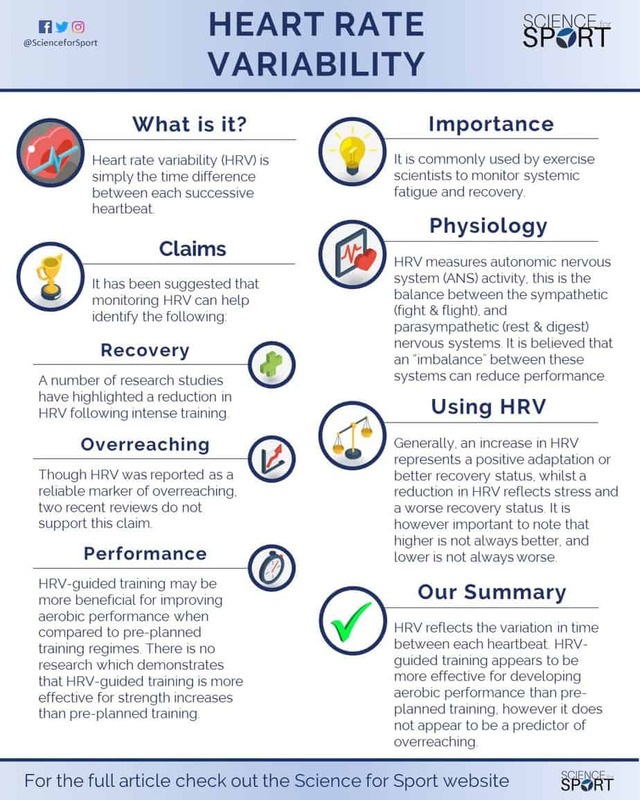 How is HRV affected by training? The interest in heart rate variability (HRV) appears to be growing year on year, particularly as technology develops and our ability to quickly establish a reliable measure using a smartphone improves. HRV reflects the variation in time between each heartbeat, otherwise known as the R–R interval or the inter-beat interval. Whilst HRV-guided training appears to be more effective for developing aerobic performance than pre-planned training, it does not appear to be a reliable predictor of overreaching – but this has been scrutinised by methodological issues within the research. HRV has been shown to be a predictor of illness in elite athletes, but its ability to predict injury is yet to be validated in humans. The use of modern technology such as smartphone applications, heart rate monitors, and finger-wave pulse sensors have been shown to be a reliable measure of HRV. Lastly, HRV can be accurately measured during ultra-short durations (1-minute), and be done so in either a supine, seated, or standing position. Keywords: heart rate variability, R–R interval, RMSSD, heart rate, recovery, sympathetic nervous system, parasympathetic nervous system Sports Science. The term heart rate variability (HRV) appears to become more and more popular as continued research into this metric keeps identifying its association with athletic performance and recovery (1). On top of this, there are now many HRV tracking Apps available for simple daily monitoring using a smartphone (2). The HRV is simply the time difference between each successive heartbeat, otherwise known as the R–R interval or the inter-beat interval (Figure 1). The time between each heartbeat is not fixed/consistent, it varies with every beat – hence the term heart rate ‘variability’. Historically, HRV has been measured using an electrocardiogram (ECG), but with the development of technology, it can now be reliably measured using smartphone applications combined with a heart rate strap (3), or a finger-wave pulse sensor (4). Whilst there are many other metrics used to measure HRV, the most common and perhaps reliable is technically known as the ‘root-mean-square difference of successive normal R–R intervals (RMSSD)’ (5). Thus in practical sporting environments, HRV is most frequently measured using the RMSSD metric. Two other common HRV metrics used within sports science are high-frequency power (HFP), and the standard deviation of instantaneous beat-to-beat R–R interval variability (SD1) (6). Asides the importance of HRV in athletic performance, its main significance is its use in the medical environment. That is, HRV has been shown to be a predictor of mortality after a heart attack (7, 8), and is also related to congestive heart failure (9), diabetic neuropathy (10, 11, 12), depression (13, 14), post-cardiac transplant (15), susceptibility to sudden infant death syndrome (SIDS) and poor survival in premature babies (16). This is where things get a little more complicated, but we have attempted to keep it as short and informative as possible. 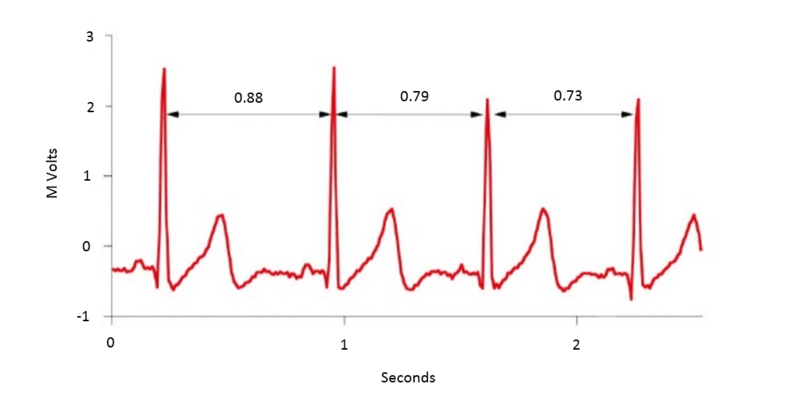 Firstly, and this is important to remember, the variability in your heart rate (i.e. HRV) provides critical information about the function of your autonomic nervous system (ANS), and it is also the most reliable measurement of ANS function (10). An increase in HRV represents a positive adaptation/better recovery status, whilst a reduction in HRV reflects stress and a worse recovery status. Having said that, it is important to note that higher is not always better, and lower is not always worse (17) – but that is beyond the scoop of this article. But as a golden rule of thumb, the higher the athletes HRV, the fitter/better recovered they are and vice versa. The ANS is comprised of two branches, these are the sympathetic nervous system (SNS) and the parasympathetic nervous system (PSNS) (Figure 2). The easiest way to distinguish the differences between these two branches is to associate “fight or flight” responses with the SNS, and “rest and digest” responses with the PSNS. 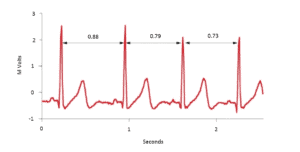 Therefore, the SNS increases heart rate and the PSNS slows it down – this can be seen in Figure 3. 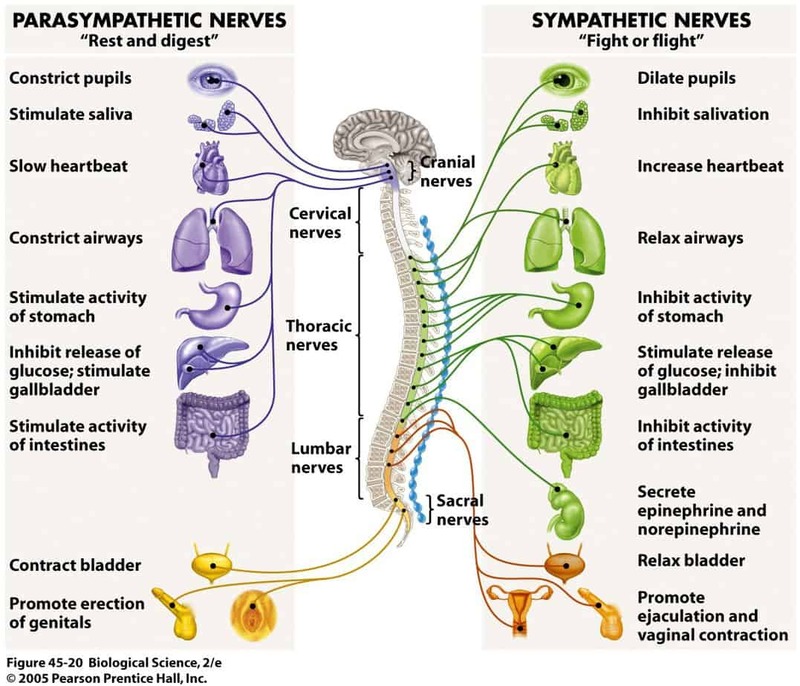 So, the SNS is responsible for “exciting” the body in stressful environments (e.g. competition) and does so by stimulating the responses seen in Figure 3. For example, one of which is by stimulating the secretion of adrenaline and noradrenaline, otherwise known as epinephrine and norepinephrine, these hormones prepare the body for stress. 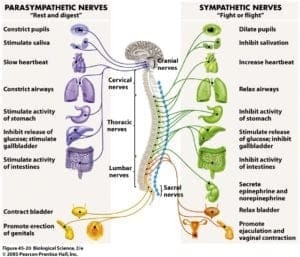 More relevantly, the SNS also increases heart rate, force of contraction, and blood pressure, leading to an increased blood flow to the muscles (18). Therefore, anytime you or your athlete has felt an “adrenaline rush” before a competition, this is essentially your SNS being stimulated and preparing you for competition. On the flipside, the PSNS does the complete opposite and is responsible for reducing heart rate and blood pressure in the absence of stress. 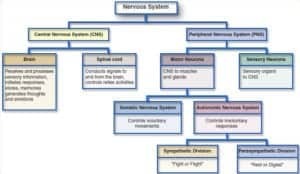 Essentially, the PSNS helps facilitate recovery after a stressful event (e.g. competition) by counteracting the effects of the SNS (18). Put simply then, the SNS increases heart rate and blood flow to the muscles, whilst the PSNS reduces heart rate and peripheral blood flow – in effect, they counteract one another. However, both are essential for performance and recovery. The SNS stimulates the body for the stressors experienced during performance, and the PSNS is vital for recovery and regeneration. It is believed that an “imbalance” between the SNS and PSNS can lead to reductions in athletic performance, and in more extreme cases, lead to overtraining (19). To add to this, HRV is also affected by mental and chemical stress as well as physical stress. For example, mental stressors such as job/work-related stress (20), making complex decisions (21), public speaking tasks (21), and performing tests/exams (22, 23) have all been shown to significantly reduce HRV. In fact, one study reported that athletes experiencing high levels of stress make smaller strength gains than those with lower stress levels (24). In addition, chemical stressors such as alcohol have been repeatedly shown to reduce HRV (25, 26, 27, 28, 29). As HRV can accurately measure ANS function (balance between SNS and PSNS) and can do so in a non-invasive manner, it is commonly used by exercise scientists to monitor systemic fatigue and recovery. Having the ability to monitor an athlete’s systemic recovery status, of course, has its “pro’s” and “con’s”. 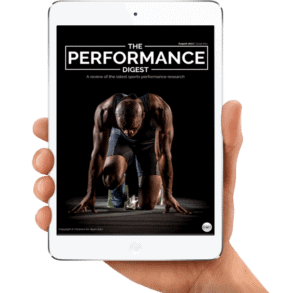 The “pro’s” mean the coach can identify the athlete’s recovery status on a comprehensive scale which includes physical, mental, and chemical stress; other than wearable technology (GPS) which only displays physical/external stress. Whilst the “con’s” mean that the coach cannot be exact with which one of those stressors (physical, mental, or chemical) is causing the highest amount of stress to the athlete – but perhaps this is where the coach-athlete interaction and the wellness questionnaires play their part. Accurately reflect recovery status (19). Help determine if an athlete is overtraining (19). Identify when the athlete may be more or less adaptive to training (aiding training prescription) (19). Potentially predict when an athlete may perform better or worse on a particular day (19). Potentially predict when the athlete is more susceptible to illness or injury (31, 32). Though some of these claims are rather substantial, there is a firm body of research to support a number of them (21, 30, 33, 6). A number of research studies have highlighted a reduction in HRV following intense training sessions. One, in particular, observed a reduction in HRV 24-hours post-workout following a high-intensity strength training session. HRV and weightlifting performance returned to baseline (i.e. pre-workout values) after 72-hours of recovery, indicating a relationship between HRV and recovery (34). Another study also found a relationship between training load and HRV before and during rowing World championships in national rowers (35). They reported that when the athletes’ were subjected to high training loads leading up to competition, their HRV dropped significantly. Once training loads were substantially lowered during competition, their HRV then increased and returned to baseline. Another study which monitored athletes over a long period of time (multiple months) found that HRV increased during an intense training period, but then stagnated and lowered during an overload training phase. But after a 2-week recovery period, HRV rebounded and even led to an increase in HRV (36). This also indicates that intense training regimes may even improve HRV. Though HRV has been reported to be a reliable marker of overreaching, two recent reviews may not support this allegation. A 2016 systematic review and meta-analysis has suggested that resting HRV is largely unaffected by overreaching – i.e. HRV cannot identify overreaching – but they also suggested that this may be the result of methodological issues that require further investigation (6). This study agrees with a previous review which also reported that resting HRV may not necessarily correlate with overreaching (33). When discussing HRV and its effects on performance, the concept of HRV-guided training versus pre-planned training is often analysed. HRV-guided training simply refers to prescribing each training session based on the athlete’s HRV score. For example, if the athlete’s HRV is normal or higher than normal, then they will be prescribed with an intense training session. Alternatively, when the athlete’s HRV is below normal, then they are prescribed with an easier, lower-intensity session. 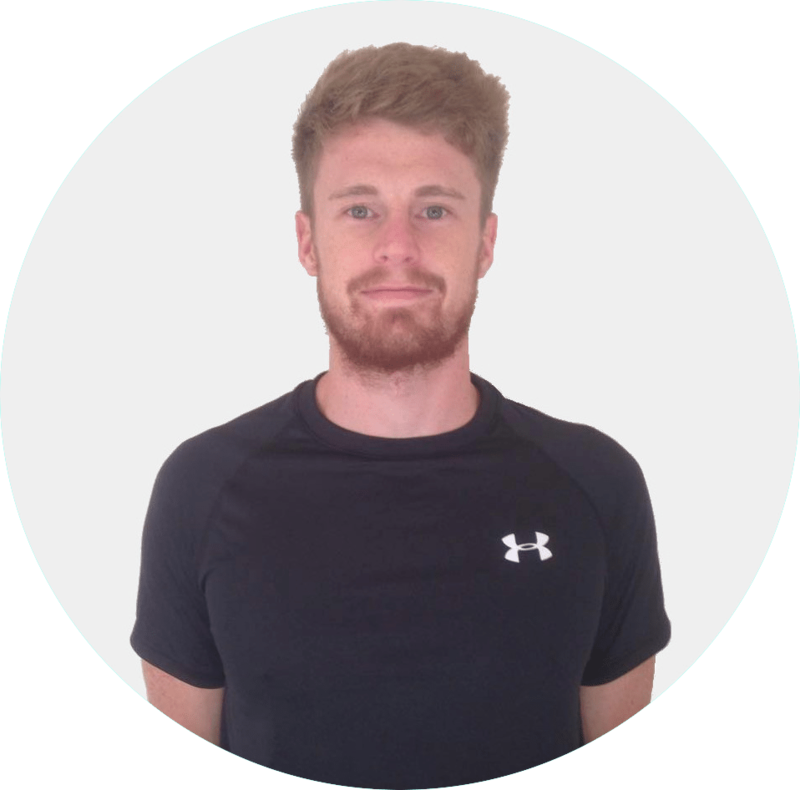 Pre-planned training simply refers to a programme that has already been designed and does not cater for daily changes in HRV. A 2007 study aimed to compare the effects of HRV-guided training against pre-planned training. The authors reported that the HRV-guided training group improved running performance (maximal running velocity) more than the pre-planned group (37). In support of this study, another more recent investigation also found HRV-guided training in males to be more effective than pre-planned training (38). Interestingly however, they did not see the same improvements in females. But, the female HRV-guided training group who performed fewer high-intensity training sessions, still experienced parallel performance gains to the pre-planned group. Furthermore, other research found a relationship between athletes who had high HRV scores and improved V02max, compared to those who had low HRV scores and showed deteriorations in V02max performances (39). All in all, this suggests that HRV-guided training may be more beneficial for improving aerobic performance when compared to pre-planned training regimes. It also suggests that athletes who have a higher HRV score may be more sensitive to performance gains than those with a lower HRV score. Important to note, there is no research to our knowledge which demonstrates that HRV-guided training is more effective for strength development than pre-planned training – the research only supports aerobic development. To date, there is little research identifying any relationships between HRV and illness or injury. In fact, to the best of our knowledge, there is only one study to date which has displayed a link between HRV and illness in elite swimmers (i.e. upper respiratory tract and pulmonary infections) (40). In regards to HRV being a predictor of injury, one unpublished study conducted on horses – another mammal – displayed a relationship between HRV and both injury and illness (31). Another study which is currently under the data collection phase is attempting to identify a relationship between HRV and overuse injuries in humans (32). The authors believe that HRV monitoring has the potential to reveal the influence of external stimuli such as fatigue, nutrition, and stress on the recovery and protection of damaged somatic tissue. Without going into too much detail and getting too technical, as it is beyond the scope of this article, we will briefly elaborate on how HRV is thought to be affected by performance. The increase in parasympathetic modulation (i.e. the PSNS ability to modulate/control its functions, reducing heart rate for example) and HRV is the result of the classical physiological adaptations typically shown following endurance training interventions. Put briefly, endurance training causes a volume load on the heart, which in turn leads to an increase in left ventricular internal dimension and wall thickness, and in end-diastolic volume (due to increased plasma volume and decreased peripheral resistance), ultimately leading to an increase in stroke volume. An increased stroke volume means a decreased heart rate can maintain the same cardiac output (at least at rest and during sub-maximal exercise). This leads to a decreased metabolic load on the heart, creating a more efficient time-pressure relationship. The decrease in resting heart rate is due in part to an increase in parasympathetic modulation, which is consequently reflected in an increase HRV (6). HRV has been shown to be a valid and reliable predictor of ANS function (10). Moreover, other than electrocardiograms (ECG), more practical methods of measuring HRV such as heart rate straps (3) and finger-wave pulse sensors (4) have also been shown to be valid and reliable. To add to this, even some particular brands such as Polar® have even had their watches prove to be valid and reliable measures of HRV (41, 42, 43). Other research has also validated the use of certain technologies such as the Omega Wave System (43) and even smartphone applications such as the ithleteTM app (3). When monitoring HRV in athletic training plans, an interesting and growing metric being used instead of RMSSD to measure acute and chronic fluctuations in recovery status is the coefficient of variance. However, this will not be discussed in any more detail within this article. Current research suggests that HRV is a very reliable measure of ANS function in adults (1, 44, 45, 46). Intra- and inter-daily measures of HRV also appear to be very reliable in elite athletes (47). However, there appears to be conflicting evidence with the research on children (6-12 years); with some suggesting it is reliable (48, 49), and others suggesting it is not (50, 51). Future research on the validity and reliability of HRV in children is therefore vital. Traditionally it took 10-minutes to obtain an accurate HRV measure (5-minutes of stabilisation followed by 5-minutes of recording), but with progressions in both research and technology, ultra-short recordings are now possible. Ultra-short recordings of just 1-minute are capable of providing reliable measures of HRV (47, 52, 53, 54, 3). Relationships between HRV and illness. Relationships between HRV and injury. HRV-guided training for strength and power development. The effects of acute and chronic HRV monitoring on performance. 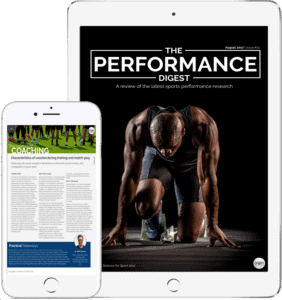 Whether athletes are more susceptible to performance gains when HRV is high. Reliability of HRV in children. Whether HRV accurately reflects recovery status in various sporting populations (e.g. endurance, strength/power, team sport athletes’) and in other varying populations (males, females, geriatric and paediatric). HRV reflects the variation in time between each heartbeat. Low HRV scores are associated with many forms of disease. HRV appears to correlate with recovery status. Resting HRV does not appear to reliably reflect overreaching. Athletes with higher-stress levels may make smaller strength gains. HRV-guided training appears to induce greater performance gains than pre-planned training programmes. HRV may be a useful predictor or illness (i.e. upper respiratory tract and pulmonary infections). HRV may be a predictor of injury risk, but this is yet to be validated by any research on humans. HRV is increased by improving the time-pressure relationship of the heart. Technologies such as Polar® watches, ithleteTM application, and the Omega Wave System appear to produce reliable HRV readings. HRV can be measured during ultra-short recordings (1-minute) and during standing, seated, or supine positions. Sports Science entails many, many topics. By choosing to simply read up on Heart Rate Variability and ignore the sea of other crucial Sports Science topics, you run the risk of being detrimental to your athlete’s success and not realising your full potential. To make you an expert coach and make your life as easy as possible, we highly suggest you now check out this article on Acute: Chronic Workload Ratio. Best heart rate variability apps in ios (Top 100) – AppCrawlr. 2016. Best heart rate variability apps in ios (Top 100) – AppCrawlr. [ONLINE] Available at: http://appcrawlr.com/ios-apps/best-apps-heart-rate-variability. [Accessed 29 May 2016]. Freelap USA. 2016. Interpreting HRV Trends in Athletes: High Isn’t Always Good and Low Isn’t Always Bad – Freelap USA. [ONLINE] Available at: https://www.freelapusa.com/interpreting-hrv-trends-in-athletes-high-isnt-always-good-and-low-isnt-always-bad/. [Accessed 08 June 2016].